The Jewish Cultural Achievement Award was bestowed on Shlomo Carlebach. This medal was given to his family in 1995, after his death. What is Jonathan Greenstein doing with Shlomo Carlebach’s Kiddush cup? Not only is Jon in possession of that becher, he also has Carlebach’s tefillin, his white gartel, a guitar of his, and–believe it or not–the piano on which the Singing Rabbi composed many of the songs that have uplifted and perhaps even redefined the way in which we daven. Reb Shlomo has not been in our midst for over 21 years now, though he is more a part of our daily lives than almost anyone else of that generation. I am sitting at Shlomo’s piano in the J.Â Greenstein gallery on Central Avenue in Cedarhurst. One of his guitars it sitting on top of the piano, as you can see. This is real live Shlomo, as close as you can get to him for now anyway. Each one of these items that will be going up for auction at the Greenstein gallery at the end of February has a story attached to it. For example, there is Reb Shlomo’s yarmulke, and it is on display now. 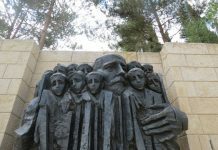 If you followed the life and times of Shlomo Carlebach to any extent, you will most likely recall that unique kippah that was always pinned to the back of his head. So Neshama, along with her sister and mother, are planning over the next several months to reinvigorate the Rabbi Shlomo Carlebach Foundation and will utilize some of the proceeds from the Greenstein auction for that purpose. I mention to Neshama that it might be that her father was the one personality who continues to demonstrate a unique impact and influence on the Orthodox community even more than two decades after his passing. She stops me and says that her father’s influence was not limited by any stretch to the frum community and that his reach was into the general Jewish community and even beyond that as well. She points out two previously unknown pieces of information about the reach of her father’s music. First she says that the previous pope, Benedict, listened to Carlebach music and used some of the tunes in the services he offered to his public in the Vatican. She also mentions that after her father passed away in 1994, she found an invitation amongst his papers to travel to Rome and sing for Pope John Paul. That the popes were fans of Shlomo Carlebach may not mean that much to many of us, but it speaks about the extent to which the inspiring nature of his songs is out there. From our shuls to the Vatican, and anywhere in between, many people have had their lives touched and inspired by Reb Shlomo. Jonathan Greenstein’s involvement with Carlebach memorabilia is like that of a man on a lifelong mission. He says, “It is not often that two of an individual’s worlds of admiration come together. Obviously, Jewish ritual objects have been a love of mine since childhood and I am blessed to have been able to work with them on a daily basis since I was 14 years old. Around the same time, as a member of the Jewish club in public high school, I was introduced to the music of Rabbi Shlomo Carlebach. I was enamored, and purchased several of his tapes, which I would play for years. I remember being a teenager and crying while listening to him tell the story of Yossele the Holy Miser or the Schvartze Wolf. I could play those stories over and over and over again and never tire of them,” Greenstein says. Neshama says that she plans to be present at the Cedarhurst gallery for the auction of her father’s possessions. There is a photo here of Abe holding the guitar with broken strings. Neshama says that the strings were broken by her father as he played the guitar tirelessly and frequently through the night, composing songs until the strings just became detached from the body of the instrument. The tallis and tefillin that Shlomo Carlebach was carrying with him on a flight from New York to Toronto when he passed away 21 years ago are also on auction. Perhaps one needs to be a collector to appreciate what it means to own a piece of Shlomo. We have seen great Torah scholars and tzaddikim who have led and moved Jewish life forward over the last 75 years. We study their advanced insights into Torah texts and are inspired by what they accomplished and the lives that they led. But who else is so much a part of our daily life as Shlomo Carlebach? Granted, you might disagree, but just consider this. We sing and hum his songs and listen to his recordings on our headphones when we are out running or walking. Shlomo Carlebach’s tunes dominate our Shabbos davening. We sing them at our seudos and dance to them at simchas. Everywhere we turn, even all these years later, Shlomo Carlebach is there. And that is especially true for his daughter, Neshama, who explains her father’s ability to compose over 3,000 compositions as a gift from above, a talent, and his being a receptacle to absorb and communicate Divine messages through song. She says that all these years later she still encounters people who tell her, “Your father is my best friend.” Neshama says that her family feels that her father’s work is not yet done and that there is so much more to do. So how much are these Shlomo items worth? Abe Kugielsky says that the yarmulke can go for a few hundred dollars, many of the other items a few thousand dollars, while that guitar and piano might be priceless. Even if you don’t plan on buying any of these items, you might want to stop in at the J.Â Greenstein gallery and just sit at the piano or touch the guitar with the broken strings that were so much a part of the Shlomo Carlebach that we all knew and loved so much. And then there is the Kiddush cup that I can just see filled to the brim with wine as Shlomo, eyes closed, recites the berachah on a Friday night, breaking into song as the wine runs over the edge and spills onto the palm of his hand. Everyone is swaying around the Shabbos table. It’s a holy moment that we really never wanted to let go of, but the choice was not ours. Can’t you see it? Don’t you feel it?